What do you do when you want to travel the cosmos but don't have a spaceship? It's easy. You just use a Warp Zone! What's a Warp Zone? That's even easier. It's a system of tunnels, passageways, and corridors built into the fabric of space-time. How do you find Warp Zones? Well, that's the tricky part. They're tough to identify and even tougher to navigate. Only one man has these hyper-dimensional gateways (mostly) committed to memory. Jack Elsewhere. So, if you're looking to leave the planet and you can't spend six figures on a luxury intergalactic pleasure cruise, talk to Jack. He'll hook you up. What are you waiting for? Sit back and soak it in as Jack and his friends take you on an afrofuturist odyssey beyond the boundaries of the Megaverse! WARP ZONE! 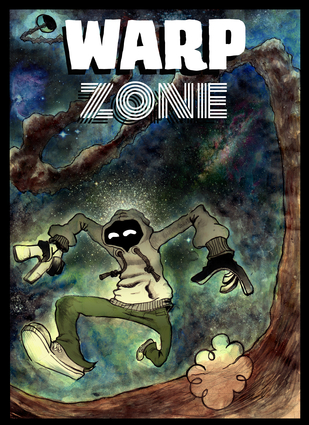 Los Angeles-based artist and writer Ted Lange IV is the creator of the afrofuturist odyssey, Warp Zone. He previously co-wrote the "Loan Sharks" story arc of Ronald Wimberly's webcomic, Gratuitous Ninja. When not working on comics, Ted writes for the theater. He was a member of the critically acclaimed Vault Ensemble, which had a residency at the Los Angeles Theater Center from 2010 - 2014.